What exactly are these "certificates"? And what value does such a degree have in the real world? We will give you an overview – and tell you what multinational companies really think about online certificates in job applications. 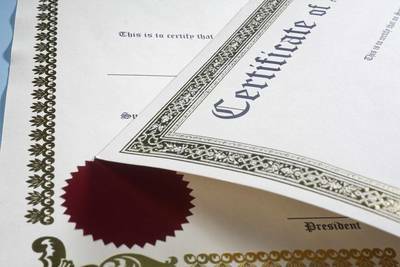 What Is a "Certificate" Anyway? Many e-learning courses offer certificates for course participants. They range from the official bachelor's degree for an online study program to a simple statement of participation for a short video course. In most countries, course providers can choose the names for their degrees with relative freedom. Only certain terms such as "bachelor" as an academic title of a university are regulated (depending on each country's individual laws). You will usually receive a "degree or certificate" only after successfully completing a test in your online course. A "statement of participation", on the other hand, is a simple confirmation without documenting a specific learning accomplishment. Course providers have quite diverse names for their certificates – from Nanodegree to the xSeries Certificate, there is no lack in variety (see below). "Certificate" is also frequently used as a general term. Learners who need an "official" degree (meaning it is regulated by law) for specific reasons should always contact the course provider upfront for details. Those who want to use online courses to collect academic credit (ECTS in Europe) for their studies should talk to their course provider and university beforehand. So far, credits for online courses are only available in very few cases. However, in practice, other criteria are often more important, especially for professional training courses. Should You Mention Online Certificates in Job Applications? For many participants, the main factor regarding a decision for a specific online course is not the name of the certificate or if it is an "officially recognized" degree. Obviously, the course content is one important factor in the decision. You can check out the course content in our directory and in the providers’ course descriptions. However, for many job applicants, a key question is whether employers even know how to assess the online course certificates. Should you mention a certificate from an online course in your resume and job application? We contacted a couple of multinational companies about this question. After all, their recruiters are handling hundreds of thousands of applications and resumes every year. So they should already be familiar with MOOCs and other online courses. Of course, decisions about job offers are always made on an individual basis. However, some general insights about online certificates in the recruiting process are possible. Most recruiters from large companies know about online courses and have seen certificates before. If the qualification gained in the online course is relevant, they see certificates as advantageous for an applicant. Several recruiters specifically mentioned that online courses listed on an application should be relevant to the job position. If the online course can be shown to teach relevant skills for the job in question, including certificates on applications can be a good idea. Since online courses are attended mostly voluntarily, this effort shows commitment on the part of the learner. Because recruiters and companies like proactive employees, showing certificates from online courses can support the job application. Some of the companies we talked to recommend including only a list of the relevant online courses on your resume. Avoid sending all the individual certificates and degrees with your application. A list of your video learning courses can also be added to your social media profiles such as LinkedIn. Most providers will give you a statement of participation (or a certificate for passing an additional test). The certificates often require a fee, even if the course is free. Course Certificates are certificates showing that you have successfully completed a MOOC video course. The criteria are different for each course. Usually, you will have to complete certain online tests and peer reviews. The certificates require a fee and your identity will be confirmed online (verification). The certificate also shows the course content provider. Institutions such as Stanford University or the Wharton Business School can be impressive on a resume. MOOC series by Coursera also have Specialization Certificates (certificates for the entire series). You can integrate the certificates into your LinkedIn profile. Additionally, there is an option for academic degrees in certain selected programs (Degrees). At edX, the Verified Certificates are optional for most MOOCs (for a fee) once you complete the course. Your identity will be verified digitally. The MOOC series at edX also have additional xSeries Certificates or Professional Certificates as confirmation of successful participation in the entire series. The certificates can be integrated into LinkedIn and other social media sites. With names like Harvard, MIT, and Oxford, the credibility of the high-quality learning content can be documented. At edX, most online courses can also be taken without a certificate (Audit). edX offers additional MicroMasters Credentials. With MicroMasters, some online courses can be credited towards an academic master's degree at certain universities. The Nanodegree course series at Udacity awards the Nanodegree Credential after successful completion of all of the courses. The value of the Nanodegree on the job market is ensured through partnerships with well-known companies (e.g. Google, Facebook, Daimler) during the creation of the course. Due to Udacity’s focus on certain innovative topics (e.g., artificial intelligence, self-driving cars), the respective Nanodegrees are well-known among experts in those fields. The certificate is included in the course costs and your identity will be verified. Upon request, British provider FutureLearn awards a paid Certificate of Achievement once you have reached a certain minimum score on the tests in your online course and your identity has been confirmed. Also included is a detailed Transcript with the learning content and your performance. If you have only completed part of the course, you will receive a Statement of Participation. You can also share it in your LinkedIn profile relatively easily. Additionally, it is possible to complete certain academic degrees via FutureLearn (Degrees). Udemy awards a simple statement of participation (Certificate of Completion) if you successfully complete a course. You can select this yourself and then download it. Obviously, the terminology and available options are constantly changing: therefore, make sure you always check the exact certification option before booking a course. Basically, all providers of modern video courses offer certificates and/or degrees. Also, academic credit is available for some courses. And many recruiters are already aware of online courses as a learning opportunity. Certificates from online courses can play an important role in job applications – as proof of job skills as well as to show your personal commitment as a learner! Online certificates also enable some differentiation from other applicants. This is especially true if you complete additional online courses relevant to the job profile. MOOC certificates with names of famous institutions like Harvard or Stanford or big companies like Google or Daimler can be signals for premium learning content. Most resumes contain a section on education (in addition to the section on work experience). If you have mastered a relevant online course and have received a certificate, you should list it in this educational section (together with school, university education, etc.). In our course directory, we list thousands of video-based online courses, MOOCs, and online lectures from 22 subject areas. You can also search for courses that offer certificates. With our Course Manager, you can organize your online learning across various providers. Are you interested in online learning? Subscribe to our newsletter here, and follow us on Facebook or Twitter!